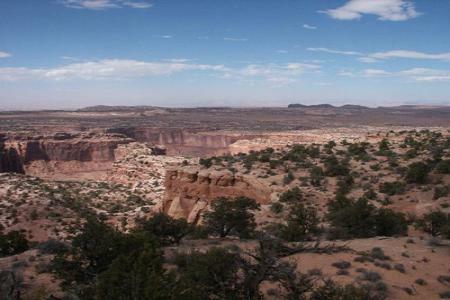 The four-wheeling part of the trail is on Mineral Point, part of the mesa country between the long, deep gashes of Mineral and Hellroaring Canyons. These side canyons drain into Labyrinth Canyon of the Green River. The headwaters of these and many other canyons around here are shallow, normally dry drainages that suddenly plunge over rimrock into deep canyons. This is a pleasant, scenic family trail but we can't assure that a stock vehicle will get through without a "thunk" of metal on rock. 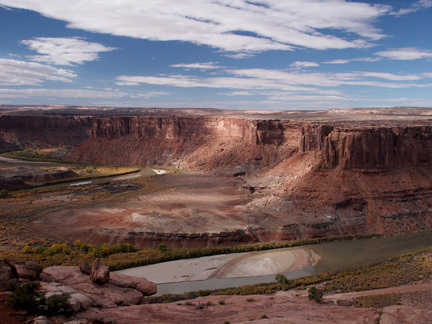 There are glimpses of Hellroaring Canyon along the way, but the final overlook near its confluence with the Green River in Labyrinth Canyon is exceptional. A ridge top provides a view 50 miles or more in all directions. 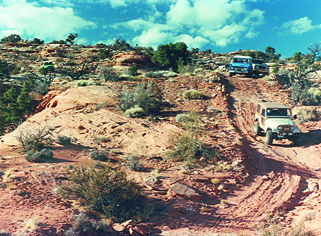 Most of this trail, like many other local trails, was scratched into the formation called Kayenta. It provides a variety of shale and sandstone that erode into rocky ledges, broken rock, and sand. A couple of ledgy, sandy, and switchbacked hills into a small canyon provide challenging descents. The climb out of the canyon is interesting, as well. The rocky ledges could grab any low-hanging parts.